Ramen is a traditional Japanese food. It has a broad variety. A variant of ramen can be known by the geographical area in which it is being consumed, although, differences still exist within the variants. Generally, ramen can be classified by its two major ingredients: noodles and broth. Ramen is produced in different shapes, lengths and sizes. It could be thick, thin, straight, or curled. Ramen is usually served in meat or fish broth, and seasoned with soy oil, green onions, or any other spices a cook wishes to add to it. We all enjoy noodles in broth. Ramen noodles.So, how about making it a little more interesting by adding weed? I carry out a lot of experiments but believe me; this is no trial and error.I look for every opportunity to add or infuse weed into my food or beverage. And Ican tell you thatweed ramen noodles is a food you can’t have enough of.It is easy, fast, and convenient. I have my personal recipe. Try it. And thank me later! You will need a few kitchen utensils: pot, stirring spoon, and a serving bowl. Ignite your stove or gas cooker and set the pot on it. Heat the pot but make sure to set the flame at medium temperature. Pour some water into the pot and maintain the temperature. The essence of this, is to make sure the water does not boil. Add weed into the heating water. If the water boils, it may vaporize the weed It even make it lose potency.It is advisable to grind the weed evenly to avoid having lumps or chunks of the plant buds in the mixture. The next step is to add one quarter of stock butter into the weed solution. The butter binds well with weed due to the THC present in the plant. Continue to cook with medium flame until the weed gets absorbed by the water. Cook at medium heat for about 25 minutes, browning of the weed occurs. At this stage, you should have a fine mixture of butter, weed and water.Always regulate the flame to prevent the mixture from boiling. Keeping to this instruction will give you the best results. The mixture should scentlike aninfusionof herbs, but with a stronger smell of cannabis.Add ramen noodles and sauce into the mixture. It is a nice aroma but you may want to mask it with other seasonings like oregano or Tabasco sauce. With a spoon, stir the noodles around for about 5 minutes and until it becomes soft. Having enough broth in your ramen noodles is essential. That’s where most of the flavor is. 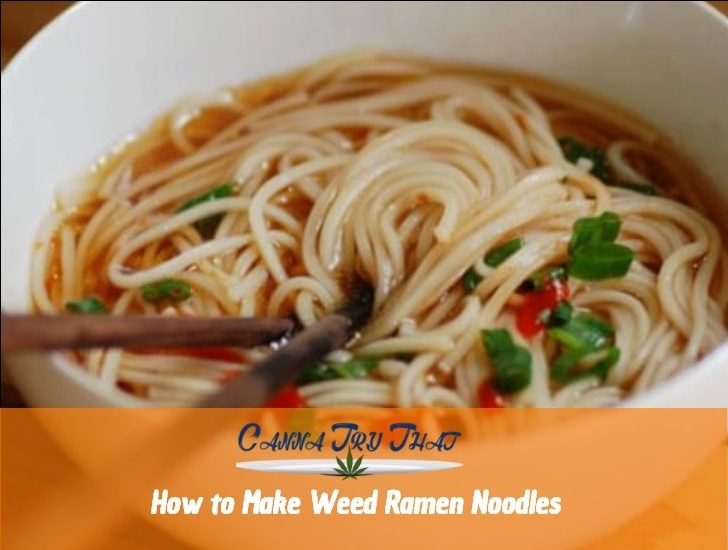 There is plenty varieties of seasonings and flavors to add to your weed ramen noodles. According to your preferences, you can make your ramen noodles taste just how you want it. It’s fast, easy, and pretty enjoyable.